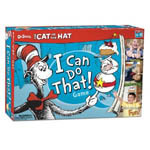 I played the Dr. Suess, Cat in the Hat I Can Do That! game with my 3 and 4 year old this weekend and they love this game. The concept is pretty simple, there are three card types, each color coded and numbered 1, 2,or 3. On your child’s turn, they draw three cards, one of each type. The cards are placed in a row to form a “mad lib” of sorts that provides the challenge that must be completed. It always includes a game piece, what to do with it, and an action to complete. So for example, grab the fish, put it on your head and hop up and down three times. Like I said, it’s pretty simple, but that type of silliness was a big hit for my kids. The game is rated for age 4-8. It certainly works well for the younger kids. There is a way to keep score and win, but for the 3 and 4 year old, we didn’t keep score and the kids had fun just doing the silly things in the game. After we ran through all the cards included in the game, we keep the fun going and made up a few of our own challenges! Overall, this is a great game that is simple and easy fun game play. 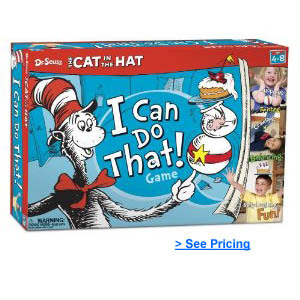 As you would expect from Dr. Suess, imagination and creativity is a big aspect of this game. If you have young kids, this is a good one to have in your family game collection since it is so different compared to many of the more traditional board games.